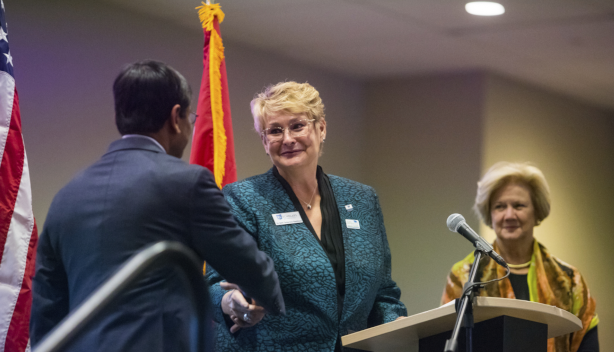 On Nov. 8, University of Missouri–Kansas City (UMKC) Chancellor C. Mauli Agrawal, Ph.D., delivered his first State of the University Address since he began his tenure as the leader of UMKC this past June. His message was ambitious and hopeful. The capstone of Agrawal’s address was the announcement of a $20 million investment towards need-based scholarships, echoing University of Missouri System (UM System) President Mun Choi’s announcement of new scholarships last September. The new UMKC scholarships are being funded by $10 million from KC Scholars, $5 million from UMKC and $5 million from the UM System’s new Promise & Opportunity Scholarship program. Agrawal’s announcement demonstrates the UM System’s commitment to advancing student success, at both the system and individual university level, by making higher education more affordable. To meet these challenges, the chancellor announced an intent to increase research funding by 50% over the next five years, with an overall goal to reach $60 million in funding by 2028. Agrawal also highlighted UMKC’s potential to advance research by partnering in the UM System’s Translational Precision Medicine Complex (TPMC) project, especially since the addition of the university’s new Data Science Institute (DSI). Throughout his address, Agrawal emphasized the importance of UMKC’s service to the community. “Our new strategic plan makes one point very clear: our foundational commitment as a university is to provide an unwavering commitment to the development of our people,” Agrawal noted, signaling UMKC’s commitment to the UM System’s mission of pursuing excellence and advancing success for Missouri.